Google is struggling to cope with its own invention; pubsubhubbub. Except, by Google I mean Feedburner. At this point about a dozen eyes will roll as the digital community say; "Urg! 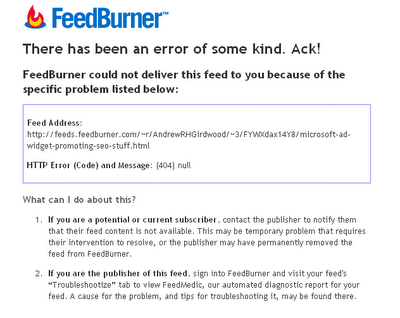 More feedburner problems!" Simply put; you can use Feedburner's Socialise offering to use pubsubhubbub speed to automatically Twitter your blog posts. This is great. A blog post is often a race. If you hit Twitter first then that's fantastic. What's not fantastic is if the short Google URL (the goo.gl URLs you see these days) gets tweeted before Feedburner is able to match them up with the original feedburned URL/redirect. You may well see errors like the one below. If you clicked on this link, from Twitter, as it was hot out of Feedburner you may well have encountered a similar error yourself.